Last month we introduced you to the new look Rare Book Room where you will now find a more dynamic page with lots of interesting content. This includes a new section specifically designed for booksellers to showcase their books. Take a look at the "Favourites From Our Booksellers" section, where you can showcase your books and increase your visibility online. Several booksellers took the initiative after the last Bookseller Digest newsletter, and sent across some fantastic books to promote to browsing buyers. Want to see your books advertised on that space? You simply need to submit your book using the Submit Your Book form. All you need is a good book, a good photo, a good description and an internet connection! The books should be in good condition, they will effectively function as a "shop window" for your business, providing an incentive for buyers to browse the rest of your inventory as well. The books will be displayed with an action button which allows buyers to add the book to their baskets directly, as well as a direct link to the bookseller's online inventory. The same feature page used on the other European websites, has already proved to be very successful - the most expensive book sold in April this year, for example, was actually purchased via the Italian website via this rare book room feature. Buyers browsing the Rare Book Room will also find a monthly special feature, collectors profiles, the most expensive titles sold in the previous month, the Rare Bookseller Directory and much more. You may have already noticed that the AbeBooks.co.uk page and the Rare Book Room now include new book carousels: pieces of technological wizardry that help us to display even more of your most desirable items. This month, the two carousels feature cover shots from Collectable Dean Koontz titles and Collectable British Authors. Using the arrows on either side of the collection (circled on the image), it is possible to scroll along from a showcase of the four book covers originally displayed to look at a further four equally engaging titles. 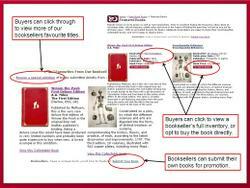 Each book that is featured can be selected by browsing buyers, taking them directly to a list of search results for collectable copies of that title. 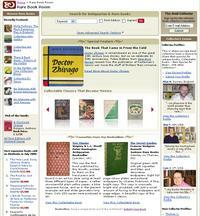 This useful link makes it easier for buyers to find some of the most exclusive editions on offer on AbeBooks. The book carousels will be regularly updated to showcase books on many different themes, leading collectors much more quickly to your most interesting titles. The photos of each title also provide the site with an attractive showcasing feature making the Rare Book Room yet more appealing to book collectors. The Customer Service team have provided a list of the most frequently asked bookseller questions this month, so that we could provide you with a quick guide to help resolve questions you may need assistance with. If you have a question that is not included below, you can always review our Online Bookseller Help pages where you will find a comprehensive list of help topics surrounding your AbeBooks bookseller account. Should you have a question that is not covered you can always contact our Customer Service team who are always happy to help. We offer Customer Service between Monday and Friday (except bank holidays) from 8am - 5pm GMT. Q: Can I change the shipping matrix, and if so how? A: Yes, you can update the shipping matrix. The matrix is flexible so that each bookseller can set their own shipping rates and speeds according to the shipping company they use. Q: What happens if I don't receive an order notification email from AbeBooks and I have to cancel an order? A: We recommend that all booksellers check their orders online in their account every 2-3 days. This helps to ensure that they are always aware of all the orders that they have received. A list of your orders is always available online in your account. The email notifications are not a guarantee as they can get lost in transmission, therefore we store all the details of your orders online in your account as well. Please review our online help pages for details on how to check your orders online: How can I process my orders? Q: How do I know which return/refund reason code to use? If you have had a refund request for an order which you are not quite sure how to handle, review our Quick returns & refunds guide on the online help pages. You will find a detailed description of what the buyer should be refunded in each refund instance. If you are still unsure how to handle the refund, feel free to contact the Customer Service team who will be glad to help. Q: How can I update my bank details? Please review our online help pages where you will find detailed instructions for updating your bank details - be advised that you can also update your credit card details - especially if your card is set to expire soon: How can I change my bank account and credit card information? Q: I have a Paypal account can I accept orders through that too? A: As well as offering credit cards as a payment method, all booksellers have the choice of offering alternative payment methods too. You can choose from Paypal, cheque, bank transfer and more. This gives buyers who do not own a credit card more flexibility to purchase your books too. If you decide to offer other payment methods you will need to ensure that you have secured that payment before sending out an order. To find out how to adjust your accepted payment methods take a look at our online help pages: How can I adjust my accepted payment methods? Q: Can I change my data format? A: A bookseller can always change their book data format. The only thing to remember is that we need to update the conversion set up on your account before you upload a new file format otherwise your new files will fail to process properly. Therefore, it will be necessary for you to forward a copy of your new file to our conversions team (conversions@abebooks.com) quoting your email address and the bookshop name so that the necessary changes can be made to your account. Q: How do I purge and reload? Q: How can I tell if my file has been processed? A: You can check this online in your account under the Yesterday's billable listings section on your Members Menu. Q: It is possible to download a report of my open listings from AbeBooks? A: Yes, you can download a list of the titles you have available for sale on AbeBooks. Once the file has been generated (NOTE: this can take up to 48 hours depending on the number of listings you have) an email will be sent with the instructions for how to download that report from your account. Q: Where can I view my completion and bookseller rating? Please be advised that the order notification emails are currently being sent with a slight delay. In the meantime, we would like to ask that you double check your orders online in your account to ensure that you are aware of all your current orders. Should you have any difficulties, or any questions, please do contact our Customer Service team who will be happy to help. First edition published in 1878 and signed by the author. A complete set of the first eight years of Abou Naddara issued in Paris. James Sanua was called Ya'qub Rufa'il Sanu' in Arabic but often referred to simply by his pseudonym, Abu Naddara (father of spectacles). Printed in 1497, this is the third volume of this monumental Latin bible issued in four parts by the celebrated Nuremberg printer, Koberger. Leather-bound. The biblical text is printed in double columns in gothic type, surrounded by the commentary of Nicolas de Lyra, who contributed much to the wider understanding of the Old Testament. First American edition printed in 1927, including first state dust jacket without review blubs on front flap. Slip of paper inscribed by Hemingway laid in reads "To Marian Spies/ wishing her much luck/ Ernest Hemingway." An 1826 edition of The Physiology of Taste by this famous French gastronome. Printed in two volumes, this edition was limited to 500 copies. These books were a key influence in the diffusion of scientific, medical and geographical knowledge to a wide audience of readers throughout the 18th century. The contents include the writings of the greatest scholars of the 17th & 18th centuries. Volumes 1-3 cover the years "to 1700"; Volumes 4-5 to 1720; Volumes 6-7 to 1733, and Volumes 8-9 to 1744. An autographed letter to her father from Katherine Mansfield, written four months before the writer’s death from tuberculosis. A reprint from 1938, the Sunrise edition, this book has the following inscription “To Lisa and Henry all best wishes Ernest Hemingway." Lisa Molony became acquainted with Hemingway when she was the business manager at a newspaper in Iowa. Lisa's Basque mother taught Hemingway the Basque language. The book comes from the library of Molony's son. Published in 1885 and containing 44 plates painted in water-colors drawn by water-color artist Francis Sinclair. Muses founded the Lion Path, a shamanistic movement. He held unusual views on mathematics, physics, and philosophy. In this 1985 book, he proposed an astrological method called 'chronotopology,' where he claimed could measure the qualitative multidimensional structure of time. It is out of print.